A Powerful, Compact Commercial Dehumidifier with 56 Pints Per Day Moisture Removal, 360 CFM, 1500 Square Foot Coverage, Built in Humidistat, Gravity Drain, Great for Basements, Crawl Spaces, Big Offices & More, All at a Discount Price with Free Shipping. Compact Size - especially well-suited for tight, low-clearance areas, such as crawl spaces. Low-Temperature Operation: This unit performs well in extreme temperatures, with its lowest operating temperature at 33 degrees F.
Daily Moisture Removal - This unit extracts 56 pints of moisture per day in AHAM testing conditions (80 degrees F, 60% relative humidity) and processes 360 cubic feet of air per minute. Rotary Compressor - A highly efficient rotary compressor ensures maximum moisture extraction at the lowest running costs. "Hot Gas" Defrosting Feature - Ebac's "Hot Gas" reverse cycle defrost feature automatically melts away frost buildup in low temperatures. The dehumidifier operates successfully in temperatures as low as 33 degrees F.
Washable Air Filter - The washable, slide-out filter keeps the unit running efficiently and removes impurities from your air while dehumidifying. Simple Standalone Installation - The unit plugs into a standard 110/120-volt household outlet. Anti-Vibration Feet - Rubber anti-vibration feet ensure that the dehumidifier remains stable and any vibration kept to a minimum. Collapsible Carrying Handles - Move the dehumidifier more easily using carrying handles that collapse conveniently to save space. Drain Hose Diameter 0.472 in. Drain Hose Length 10 ft. Practical Room Size 1500 sq. ft.
Manufacturer-Suggested Room Size (sq. ft.) 1500 sq. ft. 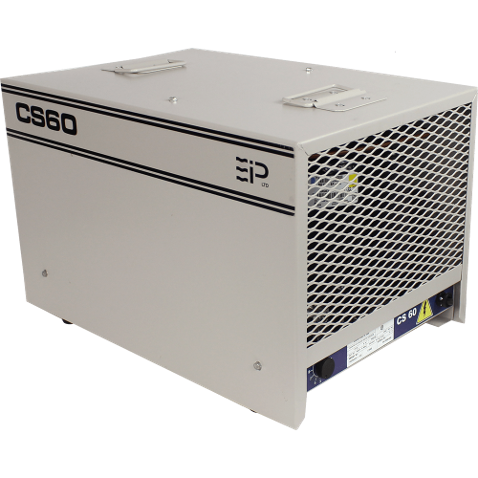 The EIPL CS60 commercial/industrial dehumidifier was designed to provide energy efficient humidity control in a wide range of applications including offices, laboratories, apartments, storage areas, restaurants, bars, museums, locker rooms, computer, telecommunication rooms and basements. It is a quiet, high efficiency, high capacity unit designed to suit your HVAC needs. The range of EIPL dehumidifiers are ideally suited to prevent condensation from forming on windows, walls and ceilings by removing excess moisture. They will also stop mold and mildew and eliminate rust and corrosion. Adjustable control humidistat to maintain the level of dryness, A convenient drain point for condensate collection and hose attachment, EIP’s unique “Hot Gas” defrosting feature which automatically melts away frost buildup providing effective operation at low ambient temperatures,Rugged, epoxy powder-coated steel chassis and housing,Adjustable humidistat for fully automatic operation, High efficiency rotary compressor, Simplicity of operation with a standard 115V plug, extra long power cord, collapsible handles make the CS60 a perfect portable dehumidifier for almost any application. Using quality R-407C refrigerant, the CS60's powerful fan draws the moist air through the cold evaporator coil, which cools the air below its dew point. Moisture forms on the evaporator coil and is collected in the condensate tray. The cooled air then passes through the hot condenser coil where it is reheated using the same energy removed during the cooling phase, plus the additional heat generated by the compressor. 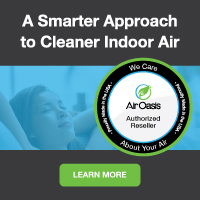 Continuous circulation of air through the dehumidifier gradually reduces the relative humidity within the area. With the CS60, you can count on low energy consumption, as well. The high efficiency Rotary compressor ensures the maximum moisture extraction with the lowest running costs. The built in humidistat automatically switches on and off to save energy and expense by maintaining the desired level of humidity with intermittent operation. The small compact size of the CS60 make the unit the ideal choice for installations where access is limited i.e. crawl spaces, etc. Order your EBAC EIP CS60 Portable Dehumidfiier here at a discount online sales price and enjoy fast, effective moisture removal in virtually any residential, commercial or industrial space up to 8369 cubic feet.